The Punch Booth • View topic - Anybody else Booth Building now ? Anybody else Booth Building now ? It would be great if he would post some pics of the build progress on the forum. Im sure I am not the only one who would be intrigued to see how it is all coming together. True I know not everyone is as trigger happy with the digital camera as me , but hopefully there will be some pics at various stages. And if anyone else is up to major builds like booths or sausage machines or signboards it would be great to see some behind the scenes building photos. Re: Anybody else Booth Building now ? I will posts photos, Richard, once my father-in-law and I get going on that project. Right now I'm building a sausage machine, which I will soon post photos of. PS: Richard I replied to the email you sent me through this site. I hope you got it. Happy Easter Sunday to one and all. Judging by the counter on my Flickr site , I think quite a few viewers of this board hop over there every now and then to spy on the progress of the build. I have been wrists deep in papier-mâché for the last couple of weeks sculpting parts of the Proscenium. Now that part of the build is finally over , it seems fitting that tomorrow I will start Day 100 with a new task - Painting ! But for now here is the unpainted Proscenium in its grey paper pulp glory. Last edited by Richard Coombs on 24 Apr 2018, 01:36, edited 1 time in total. Beautiful work, Richard! I'm awed by the time and effort you put into the things you make. The results are truly wondrous. Really, new adjectives need to be created to describe what you do. Cheers Chris , very kind of you to say that. Hows things going State-side ? Is that Sausage Machine coming along? Any photos yet? Okay, Richard. Here is the start. Very, very simple. I decided to tackle this myself, without bothering my father-in-law. This is the front frame. The sides will be similar but instead of the stage-height cross piece as shown here, the cross pieces will be lower and will support a shelf about a foot beneath the stage. Rather than bother with the booth folding, the side frames will attach to the front with removable-pin hinges. I'll just unpin them and stack the three frames. This is 3 feet wide and 6 1/2 feet high. I'll be performing hands in front of face. Pin hinges are great and underused in my opinion. Im guessing you have an estate car , or a panel van to transport your booth ? With the panels being 6-1/2 feet long , the only other guess would be a roof rack ! Good Luck with it ..and please keep the pics coming . Richard, it is just barely going to fit in the Mazda 5. That was the limiting factor. With a smaller car I would have to break down the booth more. At some point I might build a more complicated, smaller packing one or save up enough to have a lazy tongs booth shipped over to this side of the Atlantic from somebody over on your side. This one is going to be a quick build so I can get out and perform soon. Its still not too late to save yourself the hassle of building another booth later on with smaller parts. And you can still build fast and have the best of both words ...just make each of your three frames hinge and fold in the middle. Would suggest regular hinges for this, rather than pin hinges , then your three sections will 'stay' as three parts , not six which will keep assembly fast each time. Having gotten this far , the adjustment is a simple one , but will pay huge dividends. Just double up the timber at the centre of the upright for about six inches. You will now have wood wide enough to screw regular hinges to. If all three panels fold outwards , then when you pin hinge them together as planned , the whole structure would be just as strong as before. Would recommend you build your final two panels full size as planned THEN split them to fold. If this works for you , save your money on 'a lazy tongs booth from the UK' ....use that money to buy more puppets instead ! There is nothing at all wrong in a booth made of pin hinged panels. No rules ...its what works for you. Lots of people here work with 'panel' booths of one sort or another . But if you do opt to just keep em full size , and they fit your car , and that that works for you then thats Ok too - stick with it. However if you do a small amount of extra work now and fold and hinge them , then packing your car will be easier every time ...also what happens when you change your car in the future ? Aslo the doubled up wood where the new hinges go on the 'ouside' of the frame , also creates a perfect spot on the 'inside' of the frame for a pin-hinge ( or a 'flush-mount') so you can fast fix your bar of puppet hooks there. For this reason the 'Fold' in your frame may not be right in the middle ...you may end up with one panel slightly longer than the other ......work out what height is ideal for your body to have the puppets hanging - and split your frames at that spot. And keep posting Pics please . I suggest that you don't get a lazy tongs booth from the UK - you save time and money and build one yourself. They are surely the easiest to build and certainly collapse into the smallest place. In an emergency you can get one in any car, a cab, or any form of transport. The trouble with building a booth to fit a car comes when you change the car and you have to start again. That even goes for getting a different model of the same car. Often youll find, for example, that the change of an inch or so between the wheel arches means that what to lie flat on the floor of the trunk no longer does. but the two that get almost constant use are the lazy tongs booth I made in my bedroom when I was sixteen, and a Eric Sharp panel style folding booth. The latter is the quickest to erect (5 minutes tops) but is only suitable for indoor use if you have variable weather. The lazy tongs takes me around 20 minutes to erect and dress, but is far more versatile in transporting and can be used indoors or out. As far as construction goes the lazy tongs uses only basic carpentry and careful measuring. A boy of sixteen could knock one up in his bedroom! After not being happy with that first piece of frame. I started a completely different design (that was supposed to fall with my very limited carpentry abilities). It was made up of smaller pieces that fit in the car with more room to spare, but would take more time to set up. And I'm getting frustrated with that, too. The prospect of building, decorating, painting all of this; of locating and ordering all the special bits of hardware that cannot be easily found in most retail stores; of fitting and sewing curtains and trimming them. . . is becoming overwhelming. It's not that I CAN'T do it, although it would be a markedly amateur effort. it's that I don't want to do it. I'm a puppeteer. A performer. Not a booth builder. And I really dislike that so prevalent idea that you're less of a puppeteer (or magician or whatever) if you don't make everything yourself. Nobody expects actors to build the scenery or sew their own costumes. They're expected to act. So I'm making another go of trying to raise the second half of my GoFundMe campaign goal https://www.gofundme.com/puppetry-for-fairhaven-ma or trying to otherwise raise or save enough money to buy a decent booth. My wife and I are facing chimney repairs on our house and another car is going to be needed soon. I really can't use regular household money on this at this time. Two years ago I was able, with my wife's blessing, to spend $1,000 on a real black powder swivel cannon that I use all summer at a historic fort in our town during a "Pirates and Privateers" program I created. So I'd feel far too guilty about spending another large sum out of our regular savings. I'll most likely throw together some kind of screen in order to do P&J at an historical event that will be taking place in two weeks, but a "real" booth is still going to be a while in coming. The cannon looks great ... a real 'Boys-Toy' . I bet it makes a great noise too. Don't be despondent if you drew a blank with your booth building. I salute you for even having a go. Making any type of transportable booth is a huge task , and its not a job for everyone. And you are quite right , Actors don't need to build their own scenery ...they act. There are many good puppeteers and Punch-men out there that do not 'make'. Here in the UK there is for example David Wilde who buys or commissions all of his puppets and booths. I'm not sure David could even sew on a button without supervision ...but he does one heck of a good show ! Keep saving and crowd funding until you can buy what you need. Don't be downhearted ...you gave it a go , which is way more than most folk do. There are lots of nice pictures and videos starting to come through from this years Mayfaye in Covent Garden. My new booth appears in quite a few of them. But I am also aware that I am lucky to be able to make what I need for myself. At school I was utterly hopeless at woodwork and metalwork and go as far as to say I hated having to do it. The wood and metal workshops were draughty, forboding places to me with blunt tools that left me feeling frustrated and incompetent . I enjoyed sewing classes more, the school had a well equipped cozy sewing room with lots of Bernina machines ( still my favourite machine to this day). I enjoyed sewing , but honestly wasn't much good at that either. So I don't take being self sufficient now for granted. Everything I am able to do these days has been self-taught out of a desire to have the show I want. But its not compulsory to make your own stuff. You say you are going to 'throw together a screen' for an upcoming historical event...I am sure you will be able to utilise the pieces you have already made in some way, either by bolting or clamping them together , or using screws to construct it in situ on the day. I'm not surprised you are finding building your booth irksome and difficult. Choosing to make a frame booth was perhaps not a wise choice because firstly it is far more difficult to build than a lazy tongs booth, and is also far, far less portable or useful. There would be no problem in getting a lazy tongs booth in any car, however small. You can also travel with it on public transport, after all if it fits in a golf bag (which is what most of us use for carrying) then it takes up no more room than a set of clubs. It was developed in an era when most profs didn't have cars - and is still the most popular of all the booth designs for very good reasons. The Eric Sharp style booth is excellent for indoor use only, and if you do have a big enough car, and really is very quick to erect and pull down - but the lazy tongs booth doesn't take that long to put up. In fact most of the time preparing for a show is not the actual erection of the booth, but rather setting the puppets and props and setting up your sound system - that sort of thing. As for whether you should make your own booth and puppets? I agree with Richard that you don't have to do so, and I agree that there are many who don't. But I do think you are a better Punch man if you do. It's true that an actor doesn't need to paint his own scenery, but he isn't using the scenery to create his role. A puppeteer is using his puppet as part of the creation process - therefore it is more "his own" if he has made the puppet. An actor doesn't always apply his own make up - but most of them take a pride in being able to do so. They consider it part of the job. If you have made your own puppets, costumed them, painted them, built booths- adapting them where needed etc then you will be better equipped when you have the money to commission work to know what to ask for when you buy. All the mistakes a frustrations of building booths are making puppets are valuable experience. Actually most of us, when we started, just didn't have the option. We just didn't have the money. Of course it's a different world now, there is more spare cash around now, and also a different attitude to begging. It was a case of if you couldn't afford it you either didn't get it - or you made your own. Actually I think there was a positive to this situation. Because Punch men generally made their own figures - and because they didn't have great carving ability, good tools or ideal materials, there out of necessity developed the naive, grotesque style of the Punch figures which are very different from any other form of puppetry. This, to my mind, has a lot to do with Punch's lasting popularity and ability to get away with outrageous behaviour in any other puppet show. But a lot of puppeteers won't agree with me. The idea of the puppeteer as a demi god, creating and controlling his creations in their own little world is a very British idea of puppetry. In Poland and Russia for example the tradition is rather different. 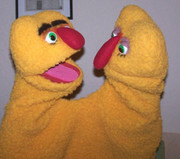 The puppeteers manipulate puppets and go to acting school to learn to sing, and speak, and project. They don't make puppets. The puppets are made by carvers who are expert in their craft just as the scene painters must have been to Art school. They are all specialists in one part of the theatrical process, and rarely share another's role. There's no one way that is correct - you takes your choice! I am old and therefore cling to a traditional or historic approach, certainly as for as Punch is concerned. In puppetry generally I take a more liberal view. Sometimes! Richard, I have seen photos of your finished booth at May Fayre. I also followed your building process on Flickr. It is a wonder! As I've mentioned in the past, I did build my own Muppet-style puppets in the 1970s when I was in high school and college. There were no plans on building things like this at that time, so I figured out a way. Their mouths were thin wood with fake fur tacked on. some of them wore real clothes. There were "life size," and heavy. I needed two foot lockers to carry just 6 puppets. My mother helped with some sewing and my father helped build a couple of different stages. So I HAVE been through all of that. At this point in life, I just want to perform again. Buying a ready made booth built by someone with knowledge and experience will get me there if I can save up the cash. Richard, I do hope to recycle booth bits for the temporary booth. Thanks both of you for your advice and support. Yes such hand puppets are bulky and eat up space ! If they are bulky at least they are generally fairly light. Good to know as I have an attic absolutely stuffed with them.